The Summers HEAT is out in full force and ToySoul’s spin-off show SummerSoul 2018 is ready to open its doors bring you a range of artists and companies heading to this years SummerSoul, so expect plenty of exclusives and meet artists in person. 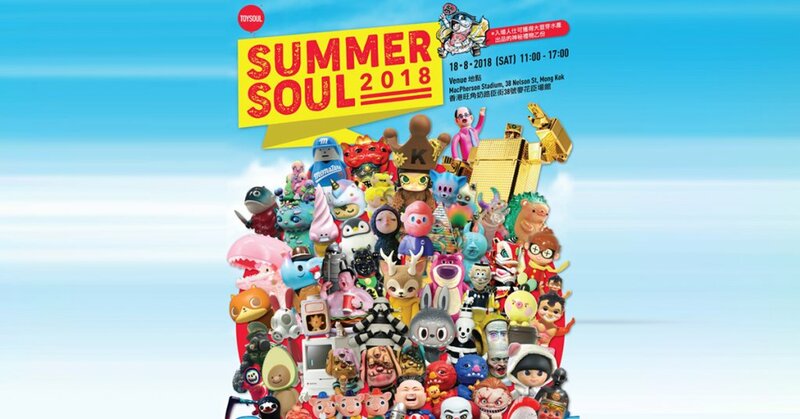 Even if SummerSoul is a one-day event, unlike ToySoul 3 day event, don’t expect anything less from the show as the line up of exhibitors include Chino Lam, ToyZero Plus, MILK CARGO, JPHB Hell Toy, Kennyworks, Unbox Industries, How2work, Pucky , Sentinel, Bigboystoys, Idee Productions, Superman Toys 超人玩具 , Angel Abby, Play, IxTEE, Devil Toys, VTSS, A Good Company, STINGRAYZ, Don’t Cry In The Morning, Awesome Toy ,TOYQUBE, POSE+, even our guys Ko-Re Ko-Re! and many many more. In 2014, we held our very first exhibition “TOYSOUL” in Hong Kong. We have made a great success through two years in terms of the number of exhibitors or visitors. TOYSOUL is a toys and goods exhibition which is being a massive platform for exhibitors to present their latest products, trendy design and also innovation concepts. There are a wild range of goods, toys and figures, including different scale of collectable figures, illustrations, digital games, side products and technological geeks. Apart from local exhibitors, there are a various amount of exhibitors coming from the globe, such as China, Macau, Tai Wan, Japan, Korea and Thailand etc. TOYSOUL is not simply a Hong Kong annual event, but also an iconic and influential goods exhibition in Asia.